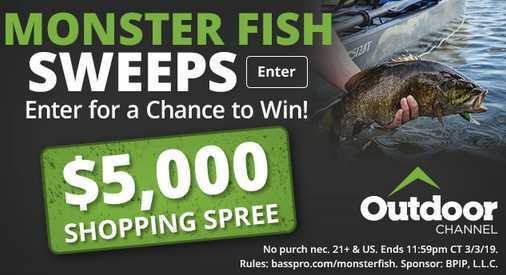 Bass Pro Shops has teamed up with Cabela’s to bring you the Bass Pro Monster Fish Sweepstakes where they will be giveaway $5,000 Bass Pro Shops or Cabela’s shopping spree to one lucky winner. How To Enter: Go to this link:basspro.com/monsterfish or www.cabelas.com/monsterfish during the sweepstakes period and follow the online instructions to register by entering all information requested on the registration form and once you filled out the entry form now Click on the submit button to complete the registration form. Prize: There will be one grand prize winner who could receive $5,000 Bass Pro Shops or Cabela’s shopping spree. Who Can Enter: Open only to legal residents of the 50 United States, D.C and Canada (excluding Quebec) who have reached the age of 21 years old at the time of entry. When To Enter: This sweepstakes entry begins at 12:00 A.M. ET on January 04, 2019, and all entries must be received by 11:59 p.m. ET on March 03, 2019. Who’s Sponsor: The Sponsor of this Sweepstakes is Bass Pro Intellectual Property, L.L.C., a Missouri Limited Liability Company, 2500 E. Kearney, Springfield, MO 65898, USA.